Introducing a revolution in the electric comfort heating industry. A Baseboard Heater that is up to 42% shorter, the 8 foot baseboard is no more, 5 foot is now the longest. The Dimplex LC and LPC Series Linear Convector! - Mor Electric Heating's Blog about home, office & factory comfort heat & freeze protection for pipes & roofs. Introducing a revolution in the electric comfort heating industry. A Baseboard Heater that is up to 42% shorter, the 8 foot baseboard is no more, 5 foot is now the longest. The Dimplex LC and LPC Series Linear Convector! More than 80 years after William Hicks invented the first electrical baseboard heater in 1925, Dimplex just made a sweeping change in the industry with a very powerful product launch. Mr. Hicks was well ahead of his time and actually successfully made a design that replaced the actual wood baseboards and hid the heater behind it. That is something that people are still trying to invent today. Hence the birth of the name “Baseboard Heater” because the heater was also the baseboards! Now Dimplex is adding to their already successful baseboard heater business with an engineering masterpiece. The heater is available in 7 sizes in 5 inch increments from 20 inches up to 5 feet long. Yes, you read correctly, the 2,500 watt heater is only 5 feet long. They have shrunk the heaters down and maintained the same price point as standard inexpensive baseboard heaters such as their own BN series, the Qmark 2500 series, Cadet baseboard heaters, etc. They are also releasing the same family of heaters with a thermostat control system that we have all been waiting for. The LPC series will have a transceiver mounted on it that allows wireless single, or multiple heater temperature control. This Electronic Thermostat is On-board and can communicate with any and all other baseboard heaters in the house. There is also a Wall Mounted Remote Control Optional accessory that also uses radio frequency to remotely control any or all heaters along with the on-board settings. Each LPC can be linked with the Wall Mounted Remote Control (optional), allowing one remote to do Whole-Home temperature control. The remote communicates by radio frequency, giving users the convenience of setting temperature, and locating the remote on the wall of their choosing. The Dimplex Linear Convector incorporates aesthetic, performance, and logistical benefits that appeal to both end users and contractors, said the company. The convector is shorter, heats faster, and reduces heat loss through the wall. 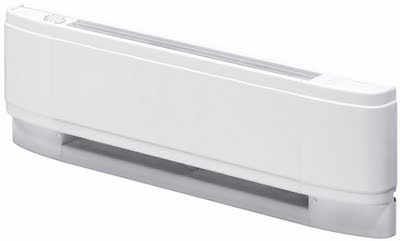 To be available in summer 2011, the linear convector is up to 42 percent shorter than conventional baseboard heaters. It features top discharge to transfer heated air to the room fast. A unique shark-fin blade shape for its heating element fins improves heat transfer and accelerates heated air into the room. This configuration also creates a laminar flow effect that reduces heat loss through the outside wall up to 10 percent, providing energy savings to the end user. It comes in a range of sizes (500-2,500 W). Previous PostThe Importance of Control to Electric Heating | DimplexNext PostIs it time to declare and title a Grand Solar Minimum (The Landscheidt Minimum perhaps?) and Little Ice Age?